The deeper I delve (pun intended) into my list of roguelike games, the more I realize that a lot of them are simply forks of forks of forks. Someone along the line didn’t like that the capital letter K was used to signify a kobold instead of a Kirin, and so re-drew the entire game along slightly different lines. unnethack is an example, as a fork of nethack, which I suppose could be called a duplicate of hack, which in turn was intended as a knockoff of rogue. Regardless of its bloodline, unnethack — developer’s blog here, with updates within the past month or so — keeps to the original form (of the original form of the original form of the …) but adds just enough new ideas to be an improvement over its forefather. Looking around the web site, some of those improvements include a vampire race, some extra monsters and items, color in the interface (which is always good), and some tweaks to levels and contents. I certainly can’t fault any of that, but the biggest improvement for me was the addition of a tutorial. Of course, after playing so many roguelike games over the past week, I am starting to get a sixth sense on how to maneuver through the dungeons. But it’s still very helpful. I don’t think it would be fair to downplay unnethack in light of things like crawl, adom, angband or cataclysm, because I tackled these out of evolutionary sequence. 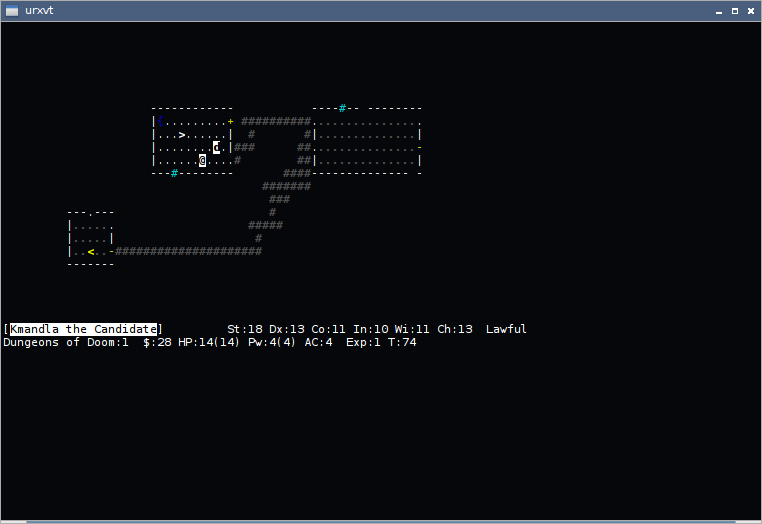 So instead I’m going to give a thumbs-up to unnethack as a definite improvement over the original nethack. Funny that you mention UnNetHack’s lineage and then mention four other roguelikes of which three are forks themselves :-). Only with ADOM the original developer is still involved. The others changed hands and names over time. But this is actually a healthy sign for open source software in general as it means the code is still maintained.